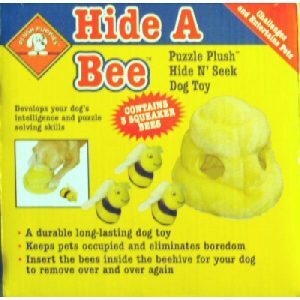 Kyjen Hide A Bee Dog Toy Puzzles are a bestselling USA dog toy puzzle that challenges dogs mentally and keeps them amused endlessly ! Makes dogs buzz with excitement !! Dogs are at their happiest digging, scavenging, gnawing, and pawing – all natural dog behaviour. These traits are what make dogs…dogs. So we shouldn’t be at all surprised when they want to chew our slippers and dig up our plants in the garden, because that’s just normal doggy stuff. Still, we often consider these natural behaviours to be “behavioural problems.” Hide-A-Bee dog puzzle toys are designed with dogs’ natural play patterns in mind. In order to solve our different puzzle plush “problems,” dogs must use their digging, scavenging, gnawing, and pawing skills. And, by allowing them to engage in these natural behaviours, puzzle plush toys create appropriate outlets for dogs’ destructive tendencies. 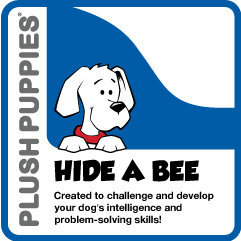 Puzzle Plush toys promise more than just play: they allow our dogs to be themselves. You can easily encourage your dog to play with these little bees, by putting your scent first on them and even perhaps hiding a treat or two in the bee hive to make the game more challenging ! Dogs love the quest of getting the bees out – they have squeakers in them too, although not that easy to squeak !! Pop the little bees back in the toy for the game to start over again !! Encourage your dog to ‘bring a bee’ for a reward. 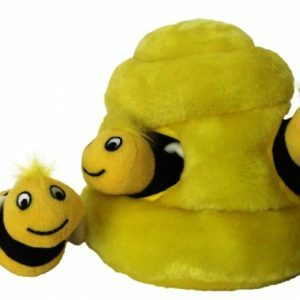 Dogs just love to toss these cute toy bees in the air, chasing after them until they catch one and then carry the little bee around in their mouth, bringing out their natural instincts of searching for and catching their prey. A good way to develop eye/paw co-ordination skills. 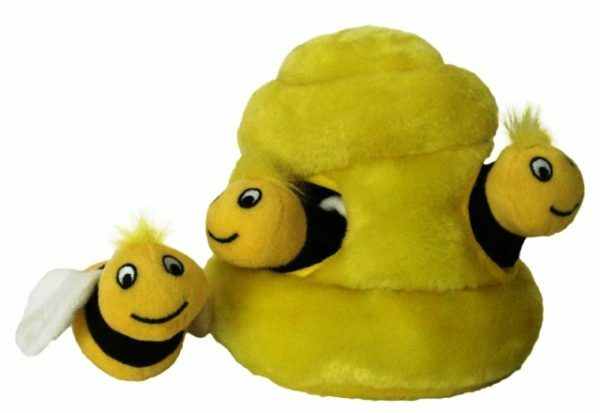 Try tug-a-bee game with your dog, they love this too and being a favourite toy at bedtime when they are tired of playing, you’ll see your dog cuddling the Plush Puppies toy and even grooming it ! !